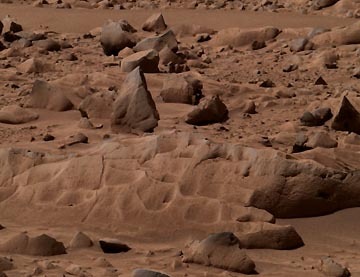 Before grinding with the abrasion tool, this approximate true-color image taken by the panoramic camera on the Mars Exploration Rover Spirit shows the rock dubbed "Mazatzal" before the rover drilled into it with its rock abrasion tool. Image credit: NASA/JPL/Cornell. NASA/JPL reports that Spirit ended sol 86 at 2:20 p.m. PST on March 31, 2004. The rover applied its flower-like 6-position rock abrasion tool brush mosaic on the rock called "Mazatzal." Below it is the ring drilled previously. Next PostNext Part 1: 25 Years After Three Mile Island, Is Another Nuclear Power Plant Disaster Inevitable?